Shannon Fosler, 2011 graduate from School of Teaching and Learning. 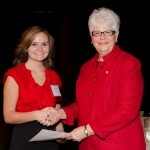 Shannon Fosler with former College of Education Dean Deborah Curtis at the 2011 scholarships ceremony. When Shannon Fosler ’12 and her parents decided to establish The Fosler Family Education Scholarship, their hope was to “pay it forward” to another hardworking teacher education major. Fosler earned a scholarship for her junior year of studies. The funds helped Fosler pursue her passion and continue her family’s long tradition of becoming teachers. Her great-grandmother, Margaret Haley ’33, was an Illinois State Normal University graduate and teacher. In addition, her great-grandfather served as a teacher and principal during his career. Fosler’s involvement in the major extended well beyond the requirements of the classroom. She helped co-found the University’s Future Educators Association Professional (FEAP) chapter; she was actively involved with Sigma Sigma Sigma, and she became the first collegiate columnist of the national FEA magazine, Go Teach. Fosler is a professional educator in Oswego, where she was just recently hired to fill a temporary vacancy in a fifth grade classroom. The College of Education recently caught up with Fosler for the following Q-and-A. What made you decide to choose the teacher education program at Illinois State University? Friends, family, and teachers at (my) school all knew I wanted to be a teacher, and they all knew that ISU would be a great place for me. So, after two, maybe three, visits, I finally decided on Illinois State! I couldn’t turn down the atmosphere. It has a large student body, but has a really small campus feel. Perfect! What was it like being a first-year teacher education student? I really liked my first year at Illinois State because I loved the fact that I could get right into my education courses. I thought it was so cool that I was learning how to be a teacher right away! My freshman year, I also got a job at Metcalf (School). I worked there for three years as a lunch supervisor, and that made it even better. I think working in an education-related field while taking education classes is such a cool thing, and I was so happy to get the opportunity at Illinois State. How did you get involved in FEAP (Future Educators Association Professional)? During our senior year in high school, my future college roommate, Lindsay, and I were really involved in our FEA chapter. We went to our National Conference in Denver that year and fell in love with the organization. We decided that we wanted to start our own chapter at Illinois State. … We worked really hard to find an advisor, get funding, and network with the University. We spent all summer doing that. We finally convinced Julie Derden, our elementary education subject librarian, to be our advisor and we loved her! I’m really proud of our chapter because they are still doing great things. FEAP was a great way for me to be a leader out of the gate in a new setting. What was your reaction when you learned that you had received the Class of 1934 Endowed Scholarship? I learned that I received the scholarship via mail over the summer. I was so excited! My parents and I agreed that I would pay a portion of my school costs so that I would have some money invested in my education. Any scholarships that I earned would come out of the money that I would pay, so you can only imagine how happy I was. It’s so great to know that there are people out there willing to help pay for someone else’s education. I love those people! 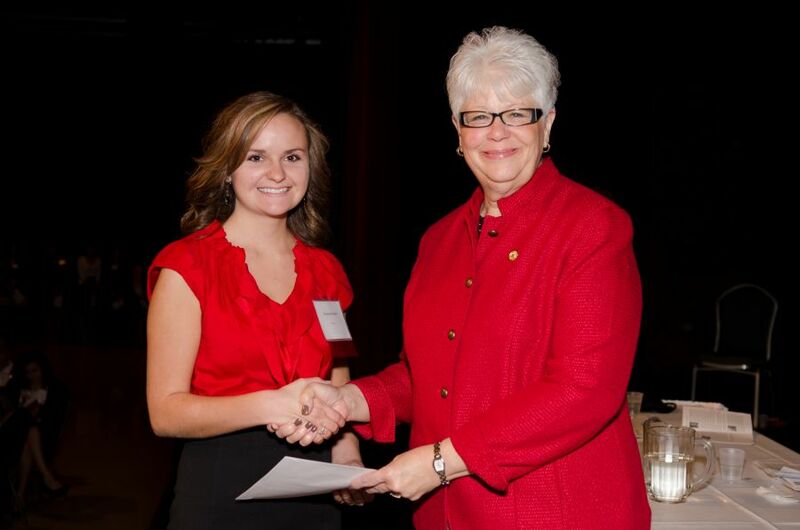 Last October you participated in the scholarships ceremony with other recipients and donors. What was your take on the event? The best part was being able to meet the people that funded the scholarship. I was amazed at how many students there were! I remember thinking how cool it was that so many people were getting help paying for their education. Where did the idea for creating The Fosler Family Education Scholarship first come from? My parents came up with the idea of our family’s scholarship because they were really surprised at how few merit-based scholarships were available. We determined that we wanted it to go to an upperclassman with a high GPA with involvement in FEAP. What are your hopes for The Fosler Family Education Scholarship? I hope that it can continue for a while! I know my parents will support the fund for several years, but I hope that I can eventually help fund the scholarship, as well. I want to be able to pay it forward to someone else just like me. What are you experiencing that you believe might not have been possible had you not come to Illinois State University? Had I not come from Illinois State, I don’t know if I would have been as successful during student teaching. I felt so comfortable with my teaching abilities from the get-go that I invited the principal and assistant principal in to observe me several times. The professionalism that I was taught at ISU definitely helped me to get ahead because I was given some amazing recommendations for the job that I currently have. What might you say to fellow first-year teachers who are also looking for a full-time position? Wanna have coffee (laughs)? I’m a recent graduate embarking on my first year as a teacher, and I’d love to talk with someone else about the stress of finding a job. The advice I’m giving myself is to hang in there, be confident, prepare for interviews, network constantly, and teach with all my heart.